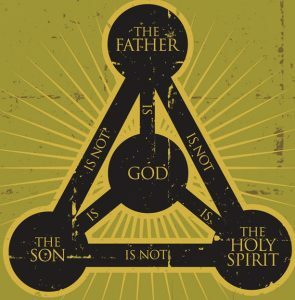 Mormonism today enjoys a fixed notion of God, Jesus and the Spirit as three distinct beings. In sharp contrast to modern, correlated LDS doctrine, Joseph Smith displayed a developing, unsettled view of the Godhead for many years. His understanding of God’s existence was a process of prolonged development rather than the result of a single, clear manifestation. Smith’s teachings were originally Trinitarian, of a Father, Son, and Holy Ghost as physically one, before evolving coincidentally right along with his increasingly elaborate first vision accounts. From 1820 to 1834, Smith believed there was one Godhead, as early editions of the Book of Mormon taught a Trinitarian view before subsequent revisions altered Joseph’s original text. By 1834-1835, Joseph’s developing theology had evolved further, affecting the periods first vision accounts. By 1835, Smith came to believe that two personages formed the Godhead, as taught in modern first vision accounts. Adam God Doctrine was taught from LDS pulpits and in temples. Ongoing confusion regarding the godhead prompted President Woodruff to declare in conference, “Cease troubling yourselves about who God is; who Adam is, who Christ is, who Jehovah is. God is God. Christ is Christ. The Holy Ghost is the Holy Ghost. That should be enough for you and me to know” (Millennial Star 57:355-356). James Talmage vigorously disavowed the false doctrine, helping to solidify what eventually became modern LDS Godhead doctrine. The 1830 version of the Book of Mormon was primarily Trinitarian, or even, Modalistic, until changes were made in the 1837 version – changes which correspond with Joseph’s developing and changing theology of the nature of God. In the 1832 version of the First Vision, only the Lord (one personage, not two) appeared to Joseph. This makes sense, given that Smith still held a Trinitarian view of God in 1832. When the LDS Church produced a new printing of Smith’s revelations in 1835, changing the name from Book of Commandments to Doctrine and Covenants, they added a series of lessons entitled Lectures on Faith. The lectures had originally been delivered before a class of the Elders in Kirtland, Ohio. The lessons provide clear evidence that they were not preaching the concept of God the Father as a resurrected man with a body as is taught today. Lecture 5 specifically distinguishes between the Father being a “personage of spirit” and the Son as being “a personage of tabernacle.” Joseph instructed that there were but 2 personages in the Godhead – the Father and the Son. He taught that the Father was a “personage of spirit” and the Son a “personage of tabernacle.” The Holy Ghost represented the combined “Mind” of the Father and the Son. The Lectures not only taught that God the Father was a spirit, but also that God was “omnipresent” and “without beginning of days.” However, Joseph Smith changed his God doctrine the 1840’s, teaching that God the Father not only had a resurrected body, but that God had not always been God, that there were deities before him. These lectures were included in every edition of the Doctrine and Covenants until 1921, when they were removed to lessen confusion about the nature of God. Although the Lectures were canonized as scripture in 1835, there exists no evidence of a sustaining vote for their removal; they were simply deleted from the Doctrine and Covenants. D&C Section 130 was added at the same time, thus officially changing the nature of Mormon God. Joseph prayed to Jehovah the Holy Father in the 1836 Kirtland Dedicatory Prayer (D&C 109). Just one month later, Jesus purportedly appeared to Joseph and Oliver in the Kirtland temple and declare himself as Jehovah, the advocate with the Father. The Book of Mormon originally referred to Jesus as “the Eternal Father” in 1 Nephi 11:18, 21, 32 and 13: 40. Evidence of an evolving Godhead view remains in Alma 11:38-39, Mosiah 3:8, Mosiah 15: 1-5, Helaman 14:12, Mormon 9:12, Ether 3:14, Ether 4:7 and elsewhere. The D&C also contains many passages that teach a Trinitarian view of God, including D&C 49: 5,28 (a revelation from 1831). 1835 – This D&C version contains Lectures of Faith and includes details of the Godhead, describing God as a spirit only. There is no mention of Joseph having seen them both 15 years earlier. As late as 1878, John Taylor, the 3rd President of the Church, was still teaching doctrine contrary to the 1838 version about the First Vision. In 1880, the Church decided to canonize the Pearl of Great Price with the 1838 version of the First Vision. Further complicating Mormonism’s evolving view of God, is the inconvenient fact that Brigham Young, as Prophet, taught that Adam was God the Father. He instructed that Adam was “…our FATHER and our GOD, and the only God with whom WE have to do” (Journal of Discourses, April 9, 1852). After Brigham got to Salt Lake, he updated the LDS temple ceremony to include Adam-God doctrine in the teaching at the veil. Adam-God doctrine was taught over pulpits and in temples for decades, surviving until 1892, more than 70 years after the first vision. Bruce R. McConkie, author of Mormon Doctrine, declared that Brigham “…expressed views that are out of harmony with the gospel… erred in some of his statements on the nature and kind of being that God is… If we choose to believe and teach the false portions of his doctrines, we are making an election that will damn us” (McConkie letter to Eugene England). The Church today refutes Adam-God doctrine, emphasizing that it was not widely believed, and seems not to have impacted the broader Church. 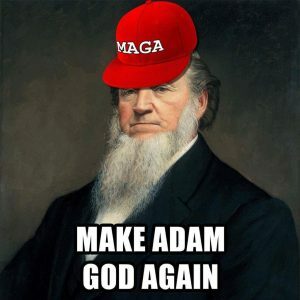 LDS apologists attempt to reconcile Brigham’s now heretical teachings with current thinking, yet he was definitely teaching that Adam is God. Q: How could there be any Godhead confusion if both the Father and Son appeared directly to Joseph Smith? Q: Why was critical Godhead text altered years after the fact? Q: Is it coincidence that Joseph’s multiple first vision recountings evolved right along with his changing Godhead views?